That is such a nice bench! I love it. I had the same problem with figuring out how to store bags-it's so hard to find a way that works. I even went back through your posts on handbag storage for inspiration and ideas! I wound up doing a similar thing, keeping them in a storage basket. I wish mine was as cute as your bench though! I LOVE the chevron print. Your bench is so cute and refreshing! Beautiful!! I'm always looking for chic storage ideas, there never seems to be enough space for everything! This bench is beautiful! I've just opened the link to see where you found it. I need all of the extra storage I can get. Have a great weekend! I love that bench, gorgeous! 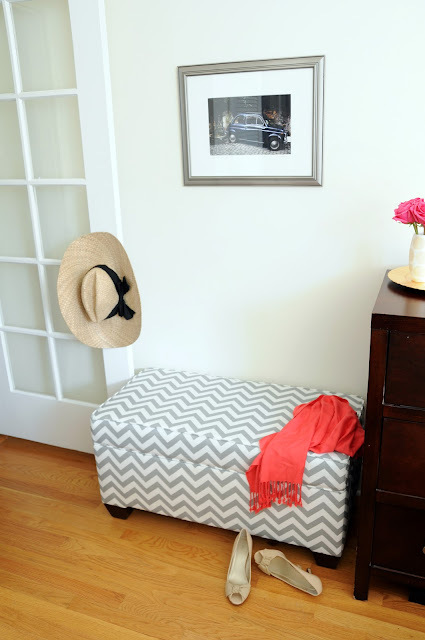 Chevron is so cool, and it looks fantastic in your apartment! I love it! What a cute little spot. I love love love the Chevron and the coral scarf! This is great! I love when beautiful furniture can be used for other purposes, especially storage!! This is great and the pillow would look awesome on it! I would love for this bench to come live in my home. It seems perfect for yours! This is exactly what we need when you walk into our condo! It's the perfect size! Thanks! I have a little something to send to you for a wee wedding gift. e-mail me your address when you have time. adorable. love the chevron print in gray.